Got a call from Larry vs Harry the other day. One of their customers had converted a Bullitt cargo bike into a power station with a wind turbine and solar panels charging a battery. That's something I had to see for myself so I called Ulrik Bing from HumanBattery.dk and met up with him and his colleagues last week. 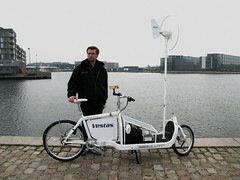 The bicycle and the wind, in Copenhagen anyway, are often at odds with each other. It's a frightfully windy city and it always seems like there is a headwind. The very idea of combining the two is fantastic. Creating a Bullitt with a wind turbine and solar panels is just one of many ideas on the go with Ulrik Bing, Carsten Koch [the construtor] and Claus Nørregaard. With the UN Climate Conference on the horizon in December 2009 they have a thick idea catalogue with ways to bring climate consciousness to the people. Speaking with them and hearing their enthusiasm as they rattle off their many idealist ideas is infectious. 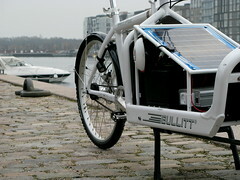 The Bullitt cargo bike is a flagship for their projects. One thing they mentioned was converting all the stationary bikes and spinning bikes in a fitness centre to power a certain selection of the electronics in the centre. They could run the lights, the tv, etc. and contribute to bringing down the electricity bill. All that human-powered energy can be exploited. 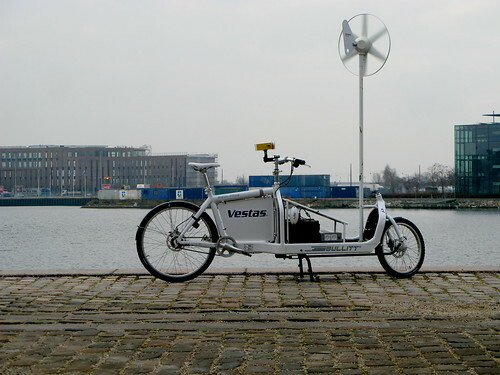 Thinking bigger, a company could have their employees ride bicycles with batteries. Riding to work would generate energy saved up in a battery. Upon arriving at work the bikes would be plugged into a grid that could power, just for example, all the lights in the foyer. Another project on the drawing board is a canal boat - there are many in Copenhagen used for tourist tours - and converting it to accomodate a solar panel roof and wind turbines. The idea is that it could sail around the harbour and act as a music venue. Docking at a quay for an audience on the shore. The ticket price would be human powered contribution to the energy needed to run the concert. 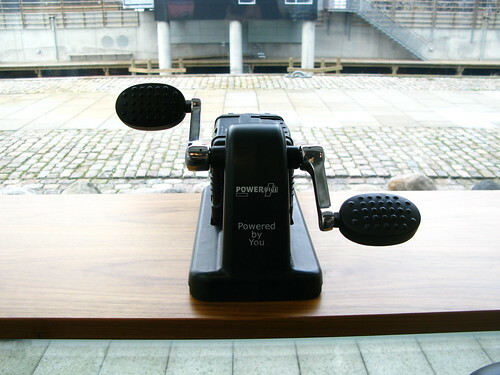 Guests could ride stationary bikes on shore, hooked up to the ship, and ride for a period of time. You ride, you get to see the concert. Ulrik spoke often of 'doing something in order to get something'. It's a kind of a mantra. We need to get people actively involved in energy creation. In the flurry of ideas there was one about how kids would have to pedal - either on their own battery-equipped bike or one at home - in order to see tv or play computer games. Carsten [at left] takes the ideas and makes them happen. There are other bikes in their arsenal. One of them is connected to a light bulb and you can ride to see how much effort it takes to keep the light lit. Then they switch the light to an energy-saving bulb. The effort required to light it is much lower. These kinds of tools are great for schools and the general public. They really hammer home how much energy we use and take for granted. Schools could take part in competitions with other schools to see who can generate the most energy with pedal power. Companies could do the same. The number of applications is infinite. I wonder what the 500,000 bicycles on the streets of Copenhagen each day could generate. How much energy is produced and, if there were batteries connected to the bikes and they could be plugged in, what could we power with it? Ulrik, Carsten and Claus are speaking with some of our major energy companies about collaborating on the many projects in 2009. We'll keep you all posted about how it's going. The HumanBattery.dk website is under construction and will be expanded.